In the last 100 years, there have been three major influenza pandemics: the Spanish Flu in 1918, the Asian Flu in 1957, and the Hong Kong Flu in 1968. These pandemics claimed the lives of approximately 50 million, 2 million, and 1 million people respectively. Added to this is the annual death toll from influenza of 250,000 to 500,000 people worldwide, with a further 3 to 4 million people suffering severe illness. These statistics make influenza an extremely important pathogen. In 1997, the alarming emergence of a new, highly pathogenic subtype, H5N1, which has a 50% mortality rate, provided a major impetus for renewed influenza research. However, the battle against influenza is difficult. Recently another subtype, H1N1, has emerged. This subtype causes a relatively mild infection in humans, however it is highly transmittable between people and a new influenza pandemic has been declared by the World Health Organization. If this virus were to acquire some of the lethal capabilities of H5N1, then the ensuing pandemic could be devastating. In this timely book, internationally renowned scientists critically review the current research and the most important discoveries in this highly topical field. Subjects covered include the NS1 protein of influenza A virus, the structure of influenza NS1, influenza B hemagglutinin, influenza A nucleoprotein, influenza A hemagglutinin glycoproteins, the M2 channel, virulence genes of the 1918 H1N1 influenza, influenza virus polymerase, gene diagnostic microarrays, and computer-assisted vaccine design. 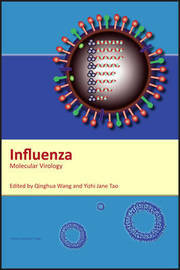 Highly informative and well referenced, Influenza: Molecular Virology is essential reading for all influenza specialists and is recommended reading for all virologists, immunologists, molecular biologists, public health scientists, and research scientists in pharmaceutical companies.